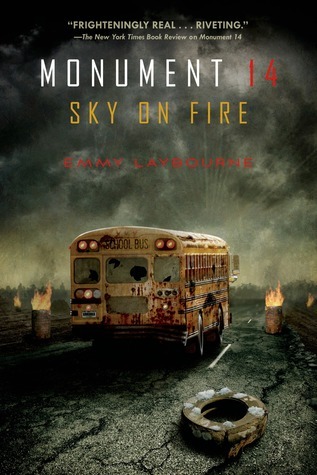 That said, I read Monument 14 in one breathless gulp and I read Sky on Fire just as quickly. I mean, come on, I couldn’t NOT find out what happened. But it’s going to be difficult to talk about any of it because – hello, spoilers. Dean goes from zero (he’s not really a zero, he just doesn’t have any confidence) to hero. His little brother, Alex, continues to act far older than his years. Niko is braver than any sixteen-year-old should have to be. Astrid turns out to be a lot more than a pretty face. Oh, yeah, and the world has gone to hell in a hand basket. The world outside the Greenway proves to be a lot more dangerous than any of the kids imagined and their mettle is tested on more than one occasion. Often the dangers aren’t environmental and there are plenty of creepy encounters with people who prove to be willing to kill to get what they want. Kids in peril. A toxic wasteland. Crazy people on the loose. What’s not to love? And because Laybourne wisely decides to leave the confines of the Greenway, the reader gets to follow one group of kids as they try to make their way to the Denver Airport (and potential help) and one group who decides to stay in the superstore (and hope help finds them). It’s all pretty exciting stuff. Okay, but then….the ending. (Which is not an ending because there’s a third book, Savage Drift) Can’t say I was a fan for a whole variety of reasons. Still, my issues are minor and even though I wasn’t as in love with Sky on Fire, I am totally in love with these kids and I will no doubt be joining them on the next leg of their journey. This entry was posted in Book Chat and tagged 2015, apocalypse, YA, YA teen by Christie. Bookmark the permalink.